Celtic have won the race to sign Scotland defender Steven Pressley. The former Hearts captain, 33, who had also undergone a medical at Charlton, was unveiled at a news conference after signing until May 2008. 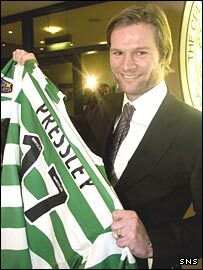 Pressley began his career with Celtic's city rivals, Rangers, but was attracted to the Scottish champions' status. "I'm passionate about my football, regardless of who I play for, and hopefully that commitment will endear me to the Celtic faithful," he said. He joins a small band of players to have played for Glasgow's two main clubs, following the likes of Alfie Conn, Mo Johnston and new team-mate Kenny Miller. "I'm absolutely thrilled and honoured to join Celtic," he said. "It's a fantastic opportunity for me at this age. "There is the opportunity to win silverware here at Celtic Park. "In eight-and-a-half years at Hearts, I got the opportunity to do that only once and it was a fantastic feeling." Pressley also admitted the opportunity to play Champions League football had influenced his decision. "It was a big draw," he said. "Obviously, as I played for Hearts in the qualifying rounds, I'm unable to play any part this season. "Hopefully there will be the opportunity next year." Pressley had held talks with new Charlton manager Alan Pardew on Thursday. But Celtic's need for defensive cover had become more pressing with this week's confirmation that Bobo Balde had suffered a broken leg. And it was Gordon Strachan who won the signature of a player who had also been linked with Southampton, Derby and Leeds. Pressley and Strachan were both at Coventry, so the manager knows his qualities well. "I've known him since he was a kid and he has got better every year, not only as a player, as a man," said Strachan. "He has shown over the last few years he is an exceptional leader. He has presence, not only on the field but in the dressing-room. "We need these kind of people at our club. Our centre-halves are young, we need a leader." Scotland international Pressley was a free agent after coming to an agreement to leave Hearts earlier this month following his criticism of majority shareholder Vladimir Romanov. Pressley also claimed there was "dressing-room unrest" at the Scottish Premier League club. Pardew, who replaced Les Reed as manager of Charlton on Christmas Eve, had thought there was a "good chance" he could win Pressley's signature but realised there was severe competition. "What I like about him is he is a leader," the Charlton manager had said. "I think we have got some very good centre-halves here, but he comes into a pack where we need characters and leadership and that is one thing that attracts me to him." Pressley is ineligible to play for his new employer before the opening of the transfer window in January.